In vitro digestion models aim at reproducing the digestive processes occurring at various stages of the gastrointestinal tract (mouth, stomach, small intestine and colon/microbiota). They can be static with fixed parameters (pH, enzyme concentration) or dynamic with parameter variations based on in vivo data. They can mimic a single step, for instance intestinal digestion, or combine several steps to better reflect the overall digestion. 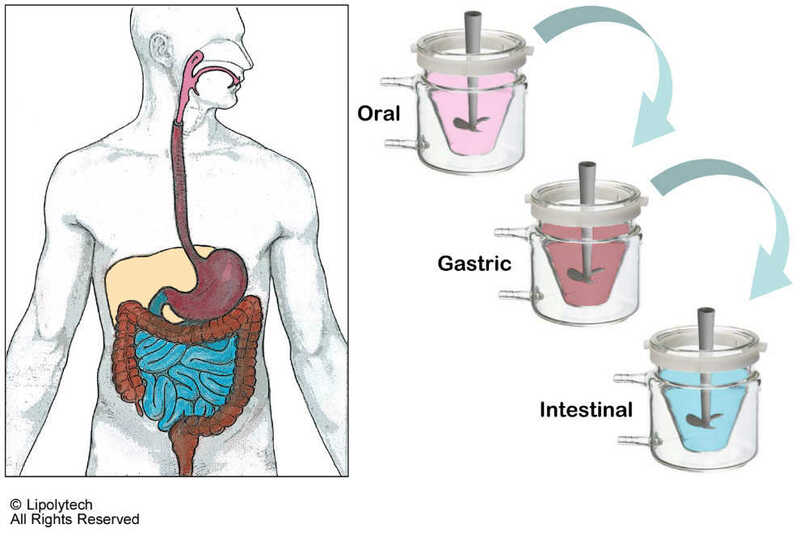 Relevant in vitro models are based on the availability of in vivo data, including pH variations and enzymes concentrations, as well as on the availability of the main digestive enzymes produced in the stomach and by the pancreas. Lipolytech provides in vitro digestions services using a two-step static model including all relevant gastric and pancreatic enzymes.